In January, on the way to the amazing Amazon River (more about that when I get photos and life sorted), I stepped ashore for a day out in Grenada and found so much to delight. I felt as if I was on my own Dutch East India Company search for spices and herbs. It was market day and the knockout colours of flags, tee-shirts and umbrellas vied with the bright fruit and vegetables against blue skies for colour supremacy. For me the highlight was always going to be seeing nutmegs in all their varying shapes and forms. Nutmeg is one of those subtle seasoning spices that can be used for sweet or savoury dishes. It is ground from the seed of a tropical tree Myristica fragrans and it ingrained on my history memory as one of the spices that was sought after by the Dutch East India Company on voyages of discovery in the 17th century. In fact there are two spice products that come from the seed. One is the ground powder from the seed and the other is from the bright red aril or lacy filament that wraps around the seed. This is called mace and it has a more intense flavour than ground nutmeg. 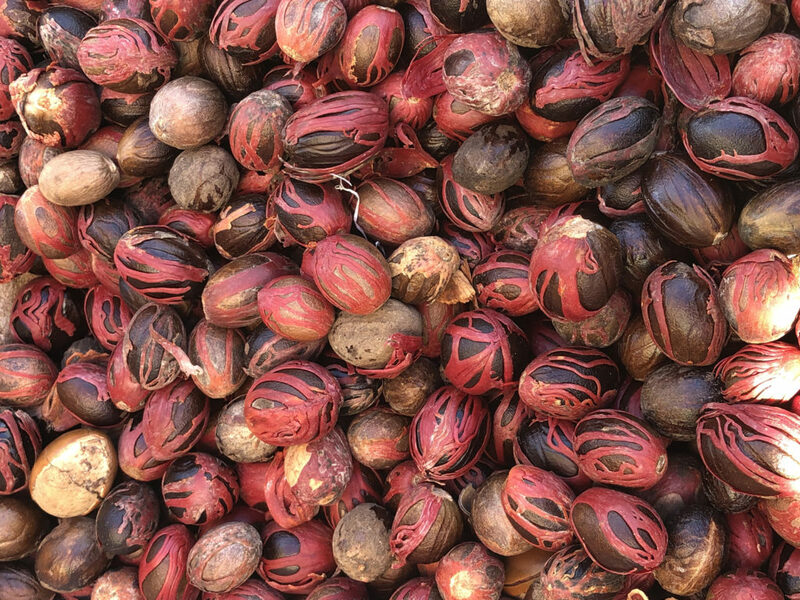 Nutmeg seeds just after harvest. 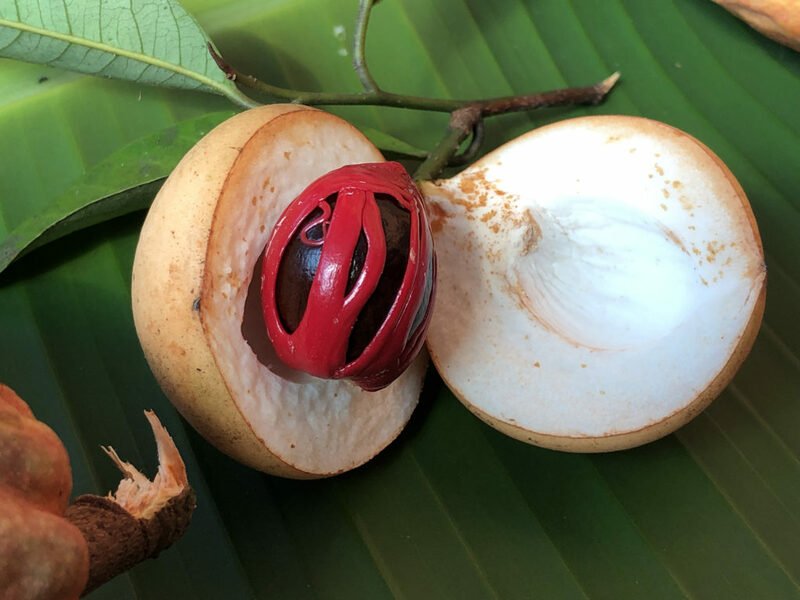 Nutmeg in the market on Grenada, showing the red arils that become mace. 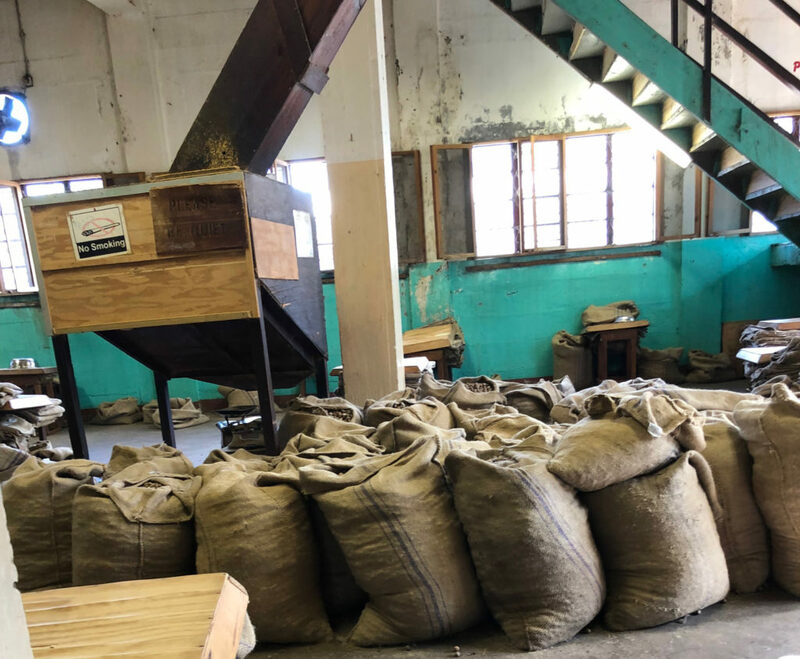 A highlight of the day in Grenada was the visit to the Grenada Nutmeg Cooperative Association, where we toured the factory, which would normally be humming with activity. As it was a Saturday there were no workers, but the aroma from the storage sacks was sweet and pungent. Nutmeg is graded and packed into sacks before being assigned to destinations. Evocative stencils that are inked onto the hessian sacks ready for distribution. 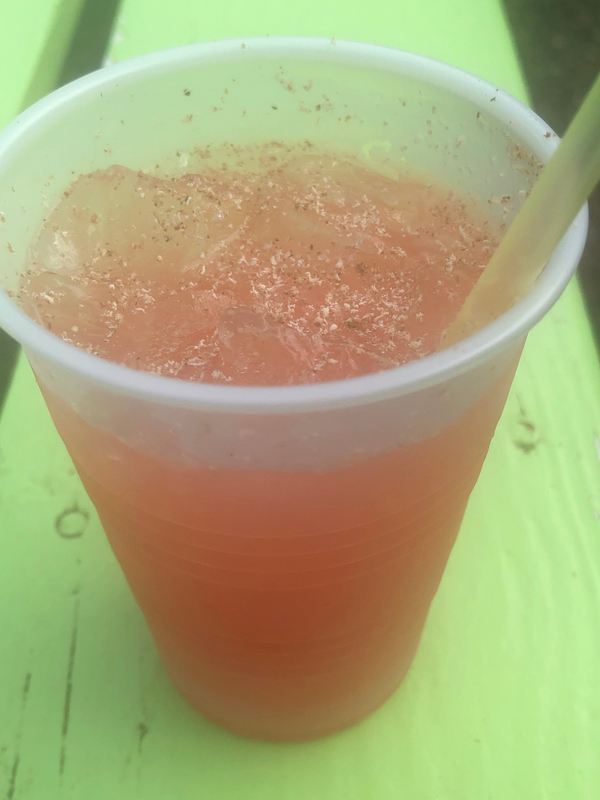 Nutmeg is everywhere on this island and my first taste of it beyond the factory was in a little lunch-time rum punch finished by the barman with a sprinkling of grated nutmeg to sweeten and deepen the cocktail. I saw these nuts/seed pods on sale and asked what they were. 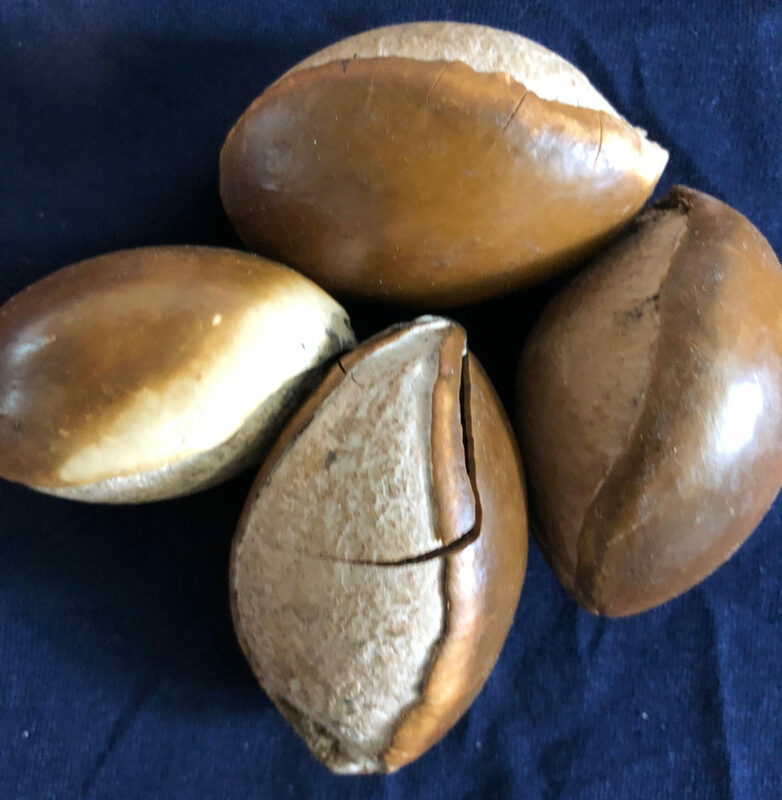 I was told they were Sapot nuts and that once out of the husks the seeds were grated and used in much the same way as nutmeg. Oh I wished I had access to a kitchen on Grenada. 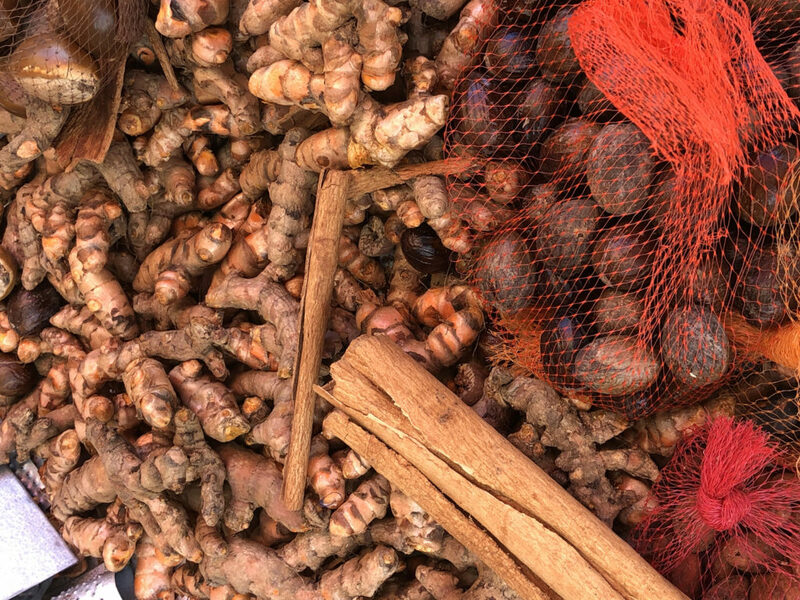 The market was so tempting – with turmeric rhizomes, cinnamon rolls and netted bags of nutmeg. You couldn’t get fresher material if you tried. 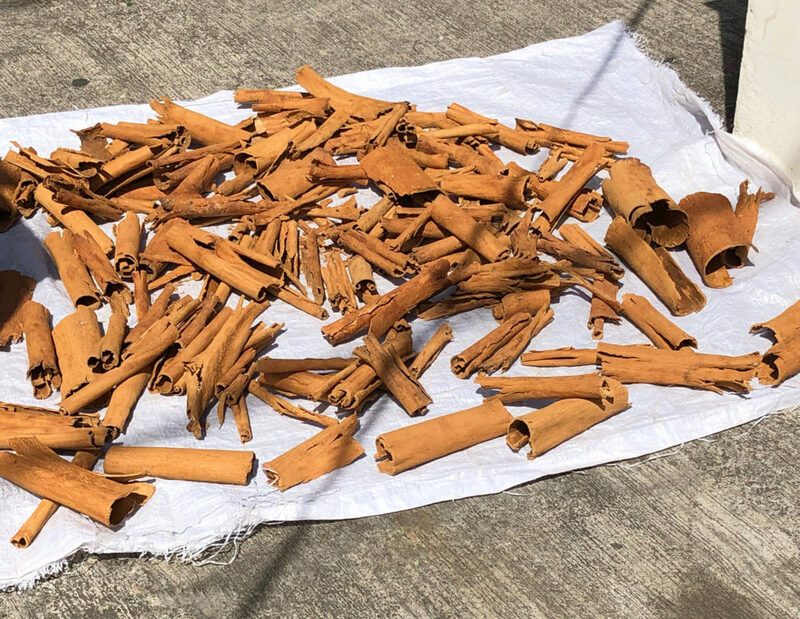 Curled cinnamon bark of varying sizes drying in the sunshine. 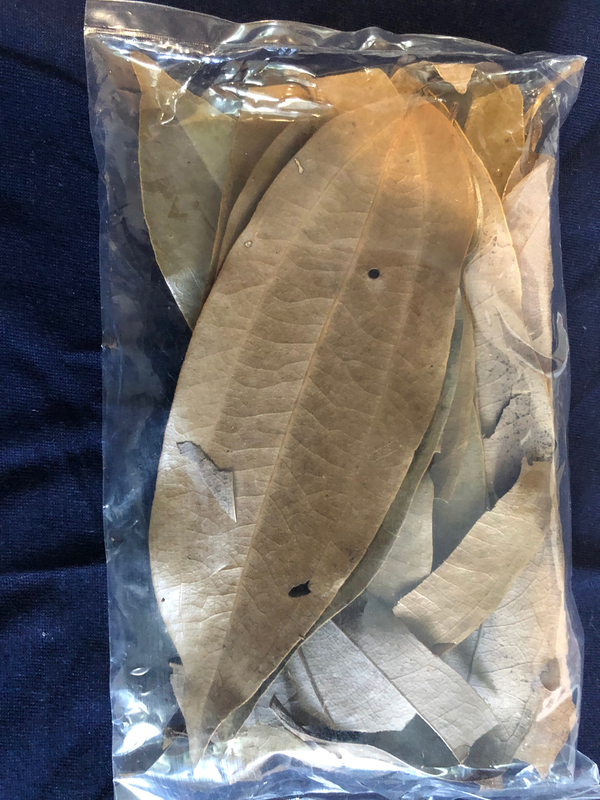 I bought a pack of cinnamon leaves from one of the vendors. 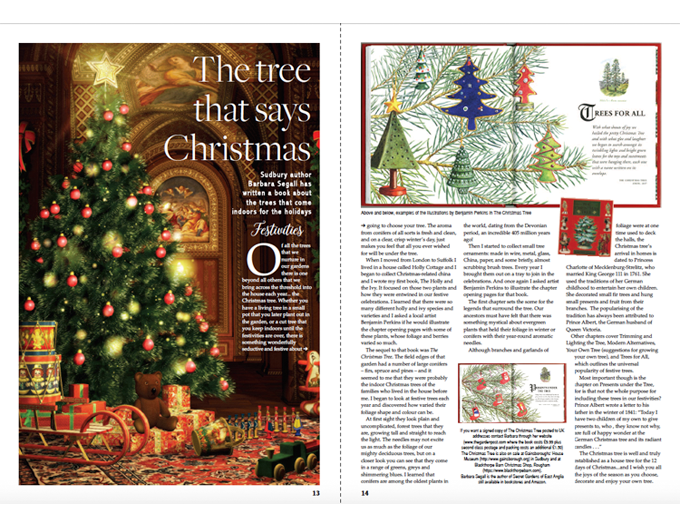 They are called Indian bay leaves but are nothing to do with European bay tree, Laurus nobilis. They come from the same tree that the cinnamon bark is harvested, Cinnamomum zeylandicum. 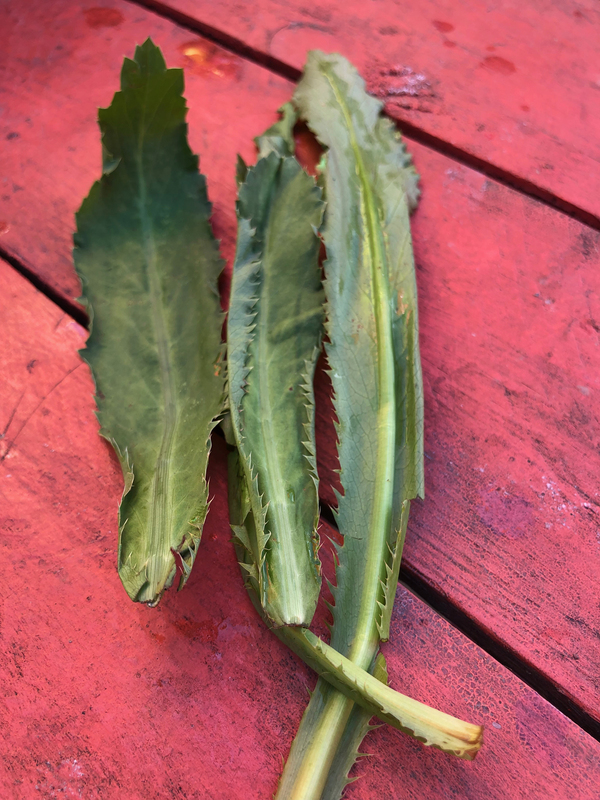 The leaves have a good flavour and are used in sweet and baked dishes. One of the sellers told me that a herbal tea using the leaves was good for weight loss… something I might have to investigate. 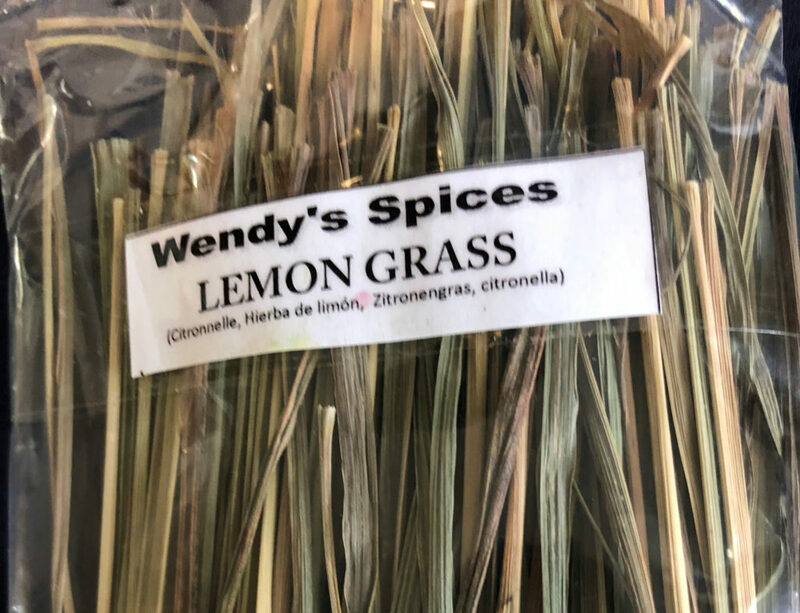 I usually grow my own lemon grass and use it fresh, but it is always interesting to see how people use herbs in other countries. 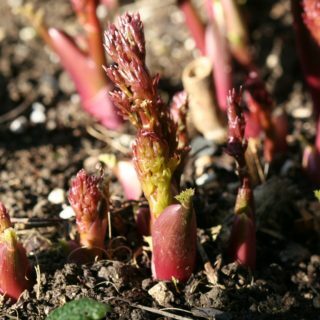 Its useful in teas and crushed as a rub for meats and fish, as well as flavouring soups and spicy dishes including curry. 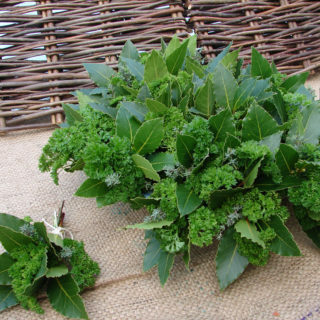 The bundle of herbs that I loved most in the Grenada market stalls was this one. So obviously freshly picked and kept from wilting in the baking sun in cool water, this handful of herbs was cooking-pot ready. 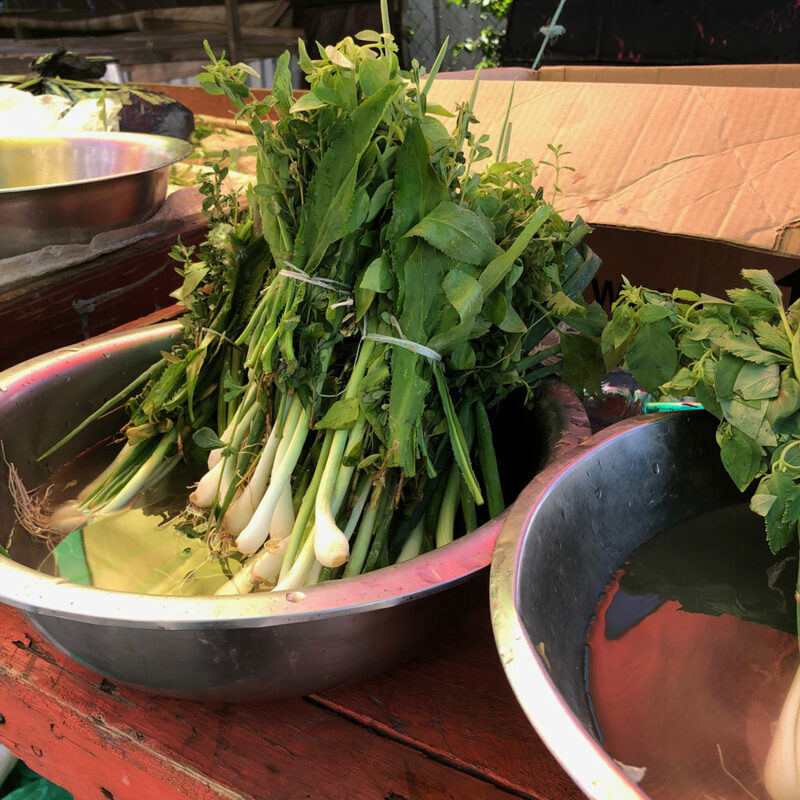 I could recognise the spring onion and the chives, as well as the thyme, but the long, rather lance-shaped leaf with toothed edges was outside my comfort zone. I learned that it is called Shado Beni and is a cilantro/coriander type herb. It has a host of common names including bandania, donnia, and culantro. 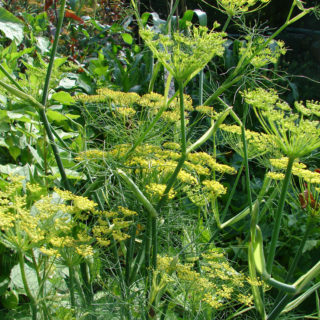 It has a similarly spicy aroma to coriander and can be used in much the same way. I think that its botanical name is Eryngium foetidum. Anyhow, it was not going to be a good idea to buy a fresh bundle, so I took more photographs of it. Close-up of the leaves of shado beni, sometimes called Mexican coriander, but used in so many dishes in the West Indies. 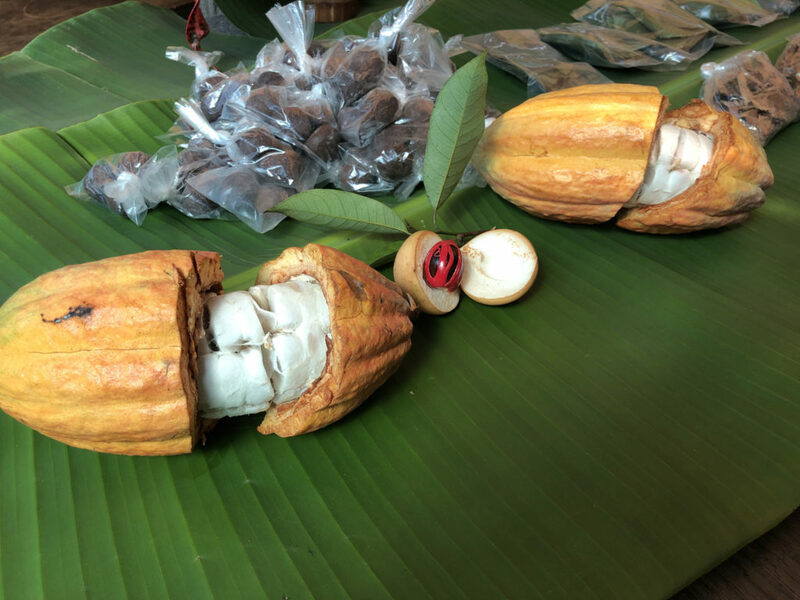 We spent a short while getting to know what the cacao pods and nutmeg fruits looked like. The brown ball-shaped objects in plastic bags are cocoa balls. The instructions are clear. 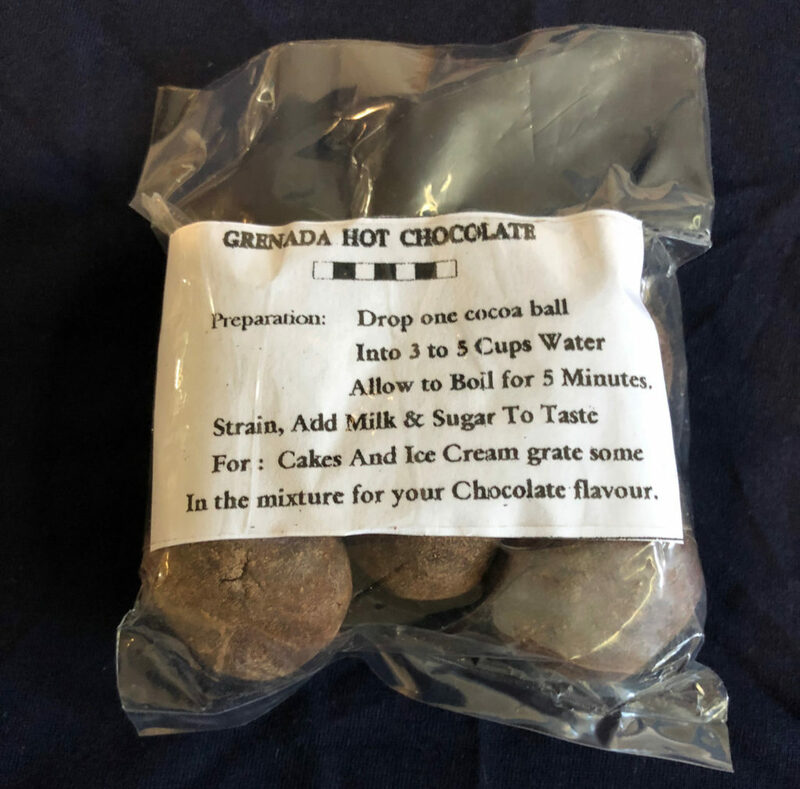 You can use the cocoa balls to make Grenada Hot Chocolate. I haven’t tasted the chocolate drink yet… so a pleasure ahead of me. Drop one cocoa ball into 3-5 cups of water and let the water boil for 5 minutes, then strain, add milk and sugar to taste… sounds like a good drink for a winter’s day. Breadfruit is one of the fruits I had not come across before. It was wonderful to see these large fruits hanging in number on tall trees, Artocarpus altilis. They can grow up to 85 ft and can yield anything from 50 to 150 plus fruits. 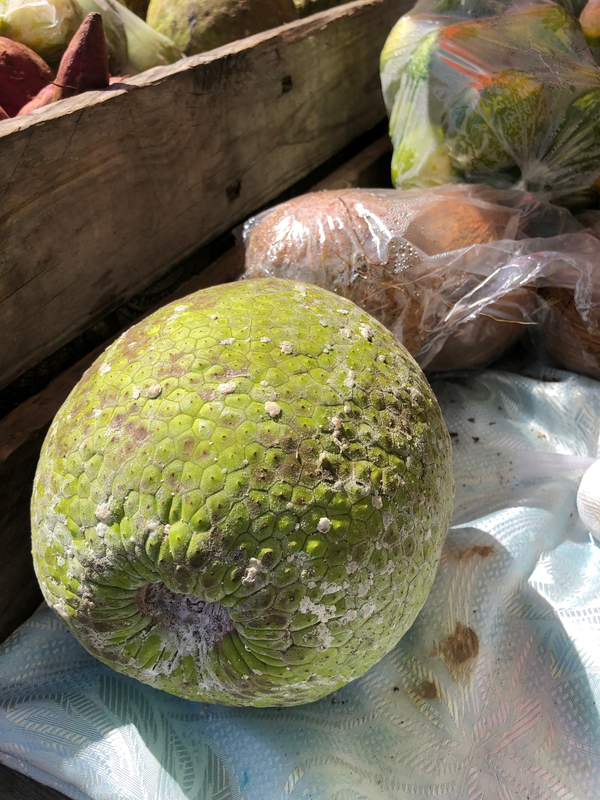 Breadfruit holds the honour of being one of the main ingredients in Grenada’s national dish Bread Fruit Oil-Down. The recipe on a bright tea towel that I bought lists the ingredients as 250g salt meat, 250g salt fish, 2 small breadfruit, 2 chives, 2 sprigs thyme, 1 whole chilli, 1 stick celery, 1.5 litres coconut milk, a small amount (one-eighth tsp salt) optional, and 1 whole pepper. The method: soak the fish and meat overnight in cold water, then drain. Remove the breadfruit core, peel and slice. Then in a saucepan place alternate layers of breadfruit, mean and saltfish. Next add the chilli, thyme and chives and add to the pan with the stick of celery and coconut milk. Cover the pan and bring it to the boil. Reduce the heat and simmer until the contents are cooked and tender. When cooked the liquid should all be absorbed and the stew oily… I haven’t tried to make this… but when I find a market that sells breadfruit I will have a go. 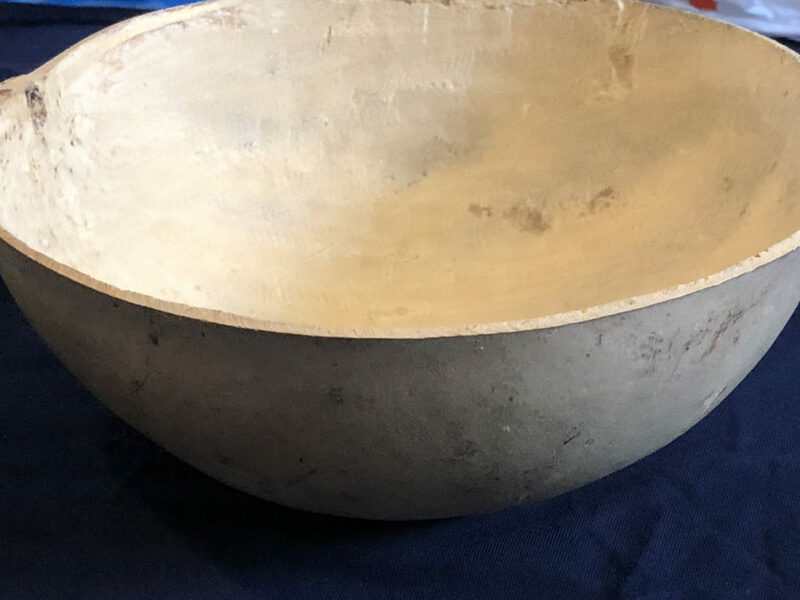 I bought this satisfyingly hollowed out and dried gourd bowl in the market in Grenada. I plan to use it to serve something that won’t mark the inner surface or leave greasy markings, so crisps and nuts are out, as are olives. Thinking caps on people! 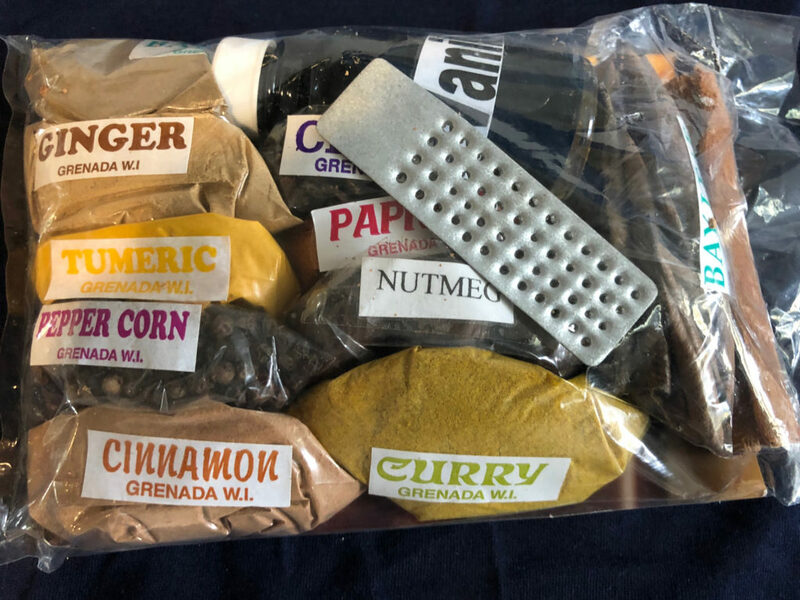 I couldn’t leave without a special collection of the spices that I had seen growing or being sold in Grenada’s market place, complete with a small grater for the nutmeg. 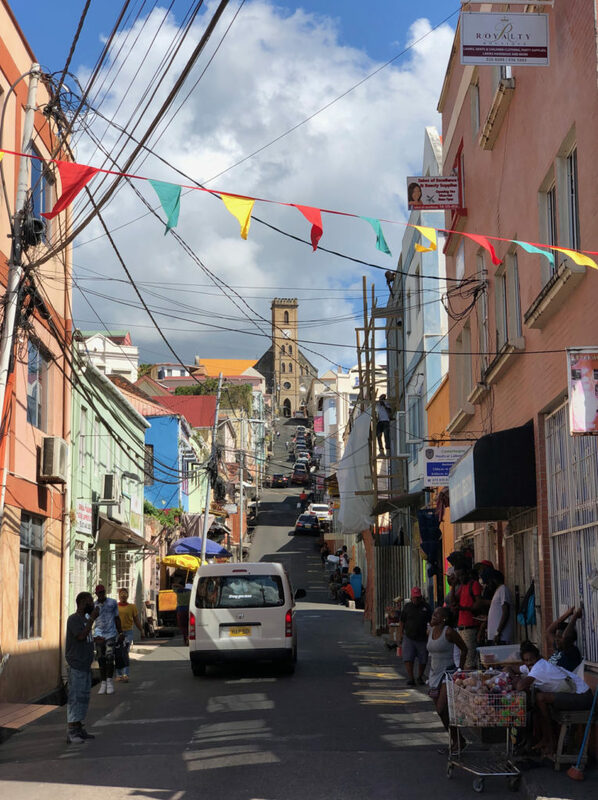 My one day in Grenada was exciting and vibrant and made me want to go back to enjoy it for longer. Streets like this one in Little San Francisco in Grenada tempted me away from the main streets. 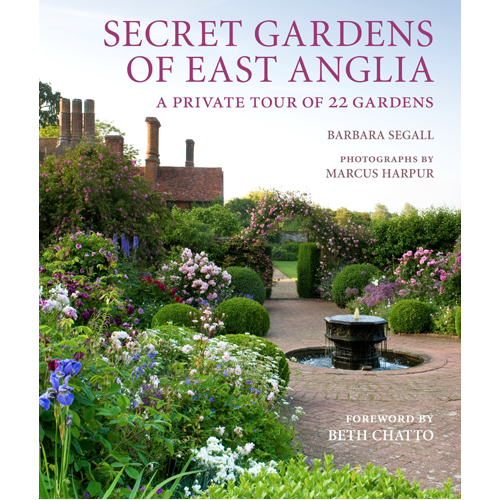 Next time I want to see gardens and meet the gardeners and florists who have supplied so many of the colourful and interesting award-winning displays of produce, floral and edible for RHS Chelsea Flower Shows over the years. 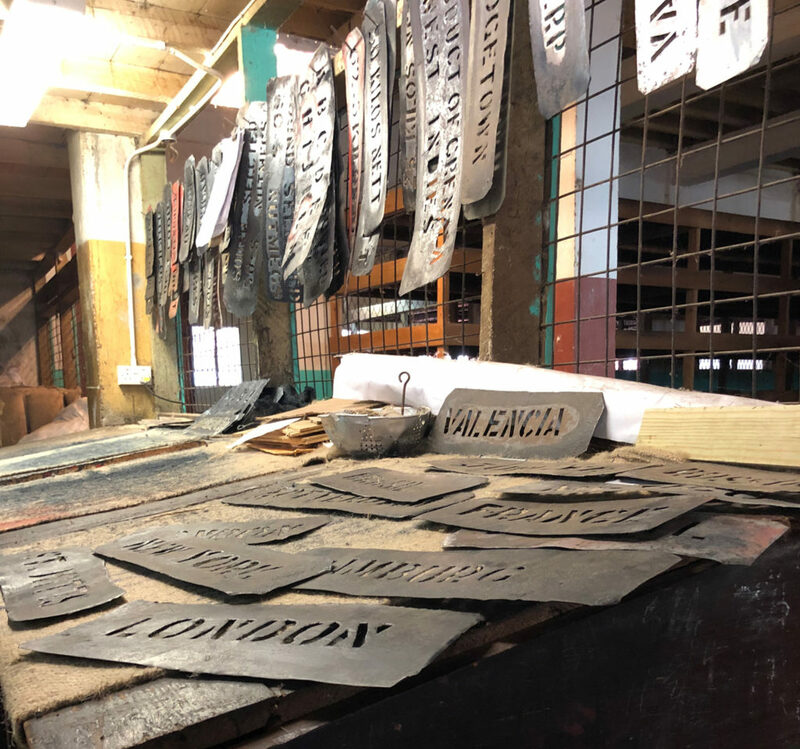 Wow – you certainly made good use of your day in Granada! Wandering the local market is such a wonderful way of exploring the local culture. Hi Margaret, I love going to markets whenever I visit somewhere. Just love the way different countries display things differently. Always so much to learn. Hope I get to go back there for more than a day! What a wonderful market visit and the nutmeg factory. I had never thought about how they did those markings on the sacks but those stencils make sense. That is the most perfect nutmeg and mace I have ever seem. Love going to markets in foreign countries. Yes the stencils were such ‘old’ but evocative technology! And the nutmeg and mace were so fresh! Loved Grenada when we visited many moons ago. 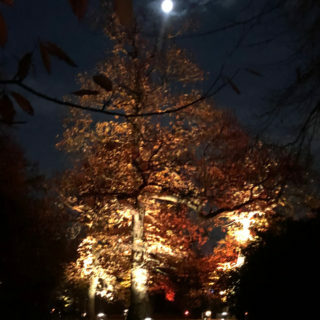 My fellow Dame d’Escoffier, Chantal Coady of Rococo Chocolate, is closely involved in cocoa plantations there and I think the cocoa plant she gave to the Chelsea Physic Garden comes from there. They have such an array of spices there, I wonder how they are used in local dishes? 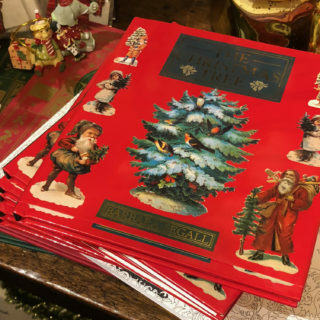 Lovely photos, Barb. I could almost smell the exotic aromas! 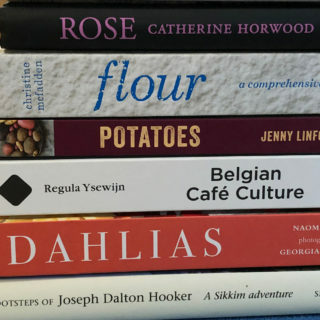 I remember you talking about your Dame d‘Escoffier group – what a great connection. 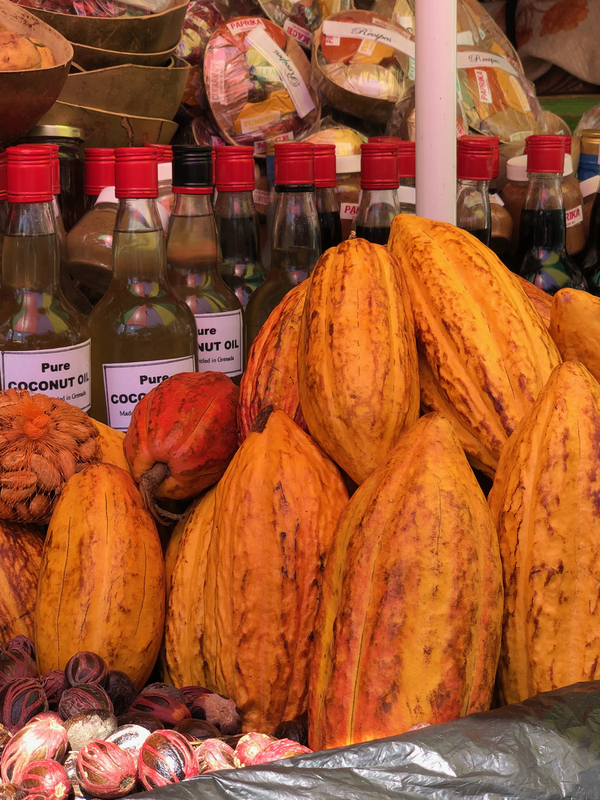 I would love to return to Grenada and learn more about the Cocoa and Chocolate. 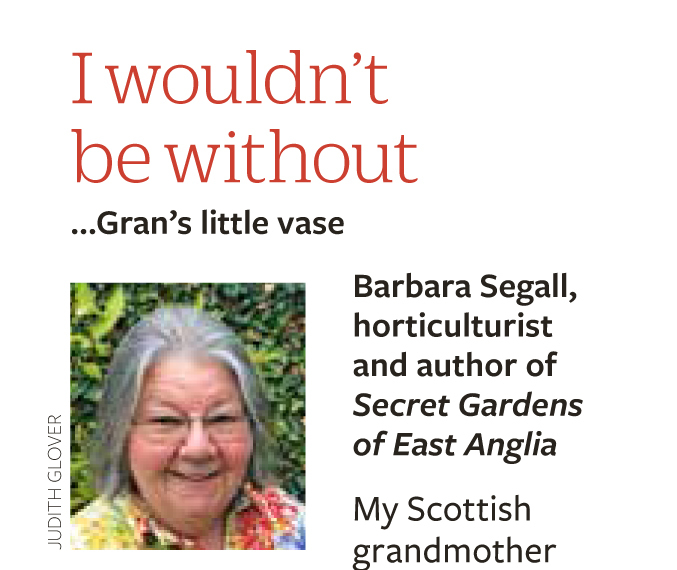 And possibly go on a cooking course to learn about the way they use herbs and spices. Thanks for being in touch. Hallo my dear Bren, it was such a vibrant place and I was on a mission to find out as much as I could in a short time! 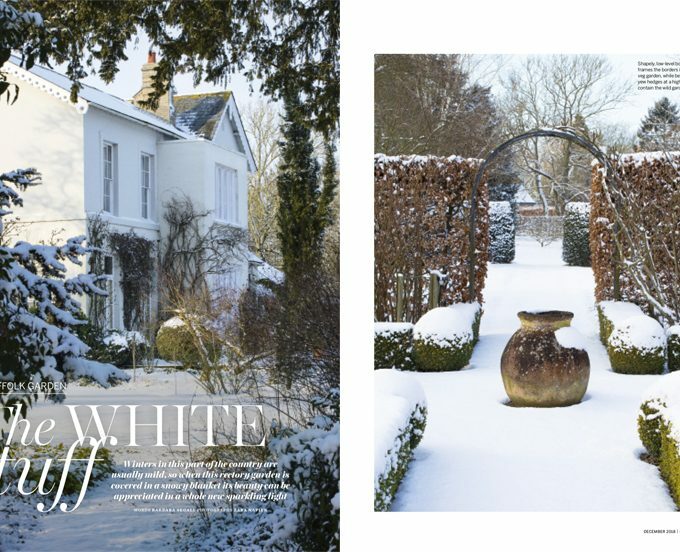 Thanks for you lovely comment about the photos!